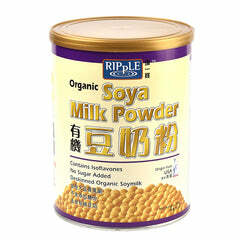 Soymilk is an important soyfood and offers many of the health benefits of soy foods. Research has shown potential health benefits of soy in preventing breast cancer, preventing and slowing prostate cancer, and fighting heart disease, osteoporosis, diabetes, and kidney disease. Soyfoods, including soymilk, are also thought to alleviate symptoms of menopause and to promote eye health. Foods based on soy fit American Cancer Society dietary guidelines to reduce cancer risk and they contain various anti carcinogens. Studies show that the typical Asian diet results in lower rates of breast, prostate, and colon cancers, compared to the typical Western diet. The mortality rate from breast and prostate cancers in Japan, which has the highest soy consumption, is about one fourth that of the USA. This Asian diet is comprised mostly of plant foods (legumes, fruits, and vegetables) and is low in fat. The Western diet has lower amounts of plant foods, is lower in fiber, lower in complex carbohydrates, and is high in fat. A particular difference is that soy is a dietary staple in Asian diets, but is not common in the Western diet. Studies show that soy foods, in particular, the isoflavones found in soy, reduce prostate cancer risks. Research has shown that soy food consumption is a factor in the rarity of death due to prostate cancer among Japanese men. Several studies show that soy isoflavones prevent the growth of prostate tumors, preventing them from progressing to the more advanced form of the disease. The hormonal changes associated with menopause can cause uncomfortable symptoms and increase the risk of heart disease and osteoporosis. During peri-menopause, women may experience symptoms including hot flashes, night sweats, insomnia, vaginal dryness, or headaches. Hormone replacement therapy (HRT) has been used to address the effects of menopause. However, it has fallen from favor because of the possible increased risk of breast cancer. Soy may provide some of the same kinds of benefits, but without the risks. Two phyto-serms (selective estrogen receptor modulators) in soy, the isoflavones genistein and daidzein, have estrogen-like qualities, but are very different from estrogen and also have non-hormonal properties. Studies are underway to more fully understand how they may serve some of the functions of estrogens, but without the health risks of HRT. Studies so far have revealed that women in Japan rarely report the symptoms of peri-menopause so common in the West and that post-menopausal women in Japan experience lower rates of heart disease and osteoporosis along with a longer life expectancy. Many western women also report that soy helps with hot flashes and headaches. Soymilk and other soy foods contain high concentrations of isoflavones. Studies from 1998 up until now have provided evidence that isoflavones promote bone health. The protein content in soy is also lower in amino acids which contain sulfur, compared to animal proteins. Sulfur amino acids raise production of sulfates in the urine, which blocks calcium from being reabsorbed back into the blood by the kidneys. Thus, one theory holds that soy protects the bones due to its low concentration of sulfur containing amino acids. The FDA has stated that consuming 25 grams of soy protein per day, as part of a diet low in saturated fat and cholesterol, may reduce heart disease by reducing cholesterol in the blood. Soy protein achieves this health benefit by acting to reduce LDL (bad cholesterol) levels, leaving HDL (good cholesterol) levels unaffected. Various studies have shown that soy can reduce cholesterol levels by 15% to 20%. For every one percent drop in total cholesterol levels, the risk of heart disease goes down by two percent. A number of research studies indicate that soy foods may help with diabetes and kidney disease. Legumes, and soybeans in particular, have a very low glycemic index, making them an important component of a healthy diabetic diet. Soybeans were recognized to be helpful in controlling blood sugar as early as 1917. In that year, the Journal of Medical Science reported how diabetics who consumed soybeans passed less sugar in their urine, evidence of improved diabetes control. It is the soluble fiber in soy that provides this effect, so soy foods containing more fiber are important. The okara or soybean grinds left after making soymilk can easily be added to many baked recipes in place of flour, significantly raising both fiber and protein content. The fiber in soy apparently helps to slow absorption of sugars so that it is easier for the body to handle. A diet high in soluble fiber and high in complex carbohydrates has been shown to have a health benefit by actually improving insulin sensitivity. So, soy fiber, in a healthy diet, may help control diabetes by making the body more sensitive to insulin in the bloodstream, while slowing the release of glucose into the bloodstream to a more manageable rate. While a low-protein diet is frequently recommended for diabetes control, a soy-based diet may be preferable. The high-quality protein contained in soy does not stimulate hyper filtration and proteinuria. Soy's ability to lower LDL cholesterol in the blood also helps to prevent kidney damage. New research shows that the isoflavone genistein protects against x-ray induced cataract formation in rats. Soy is particularly high in genistein. Other recent research indicates that soy may also act as a radioprotectant. A radioprotectant would be administered prior to exposure to ionizing radiation to mitigate radiation damage. This could have health benefits and application in cancer treatment, radiation contamination cleanup, and space travel. Research conducted at the University of Minnesota looked at fifteen classes of phytochemicals that show anticancer activity. Phytochemicals are compounds that, while not classified as nutrients, do have profound health benefits. These compounds occur naturally in fruits and vegetables, including soy.